Use for adjusting headlamps. Made of heavy vinyl banner material with grommets and height markings to allow up to 54". Mount this screen on the inside of your repair facility. Height indicators show where to place aiming string and 4" markers for correct vertical and horizontal alignment according to PA Safety Inspection Regulations. For PA State Safety Inspection Stations, this screen can only be used if you have the required inspection area of 12 ft wide x 43 feet long minimum space within an enclosed building, as well as a level floor. States other than PA, please check your state requirements for safety inspection. Physical dimensions: 120 " wide x 54" high (mount 12" from floor) $265.00 each plus shipping and tax. SPECIAL NOTE: If you require this product to obtain your Inspection Station License Approval, please call to verify availability 1-800-692-7295. 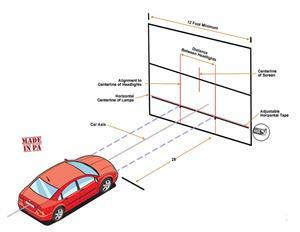 Also Approved for MOTORCYCLE INSPECTIONS- Bay size should be 10' wide x 32' long. See a Video Demonstration of this product on PAA's Facebook page.